How fortuitous that the 2-year anniversary of LUNCH falls more or less on President's Day! Because even though we're working today, the quietness of the day is extremely conducive to a long lunch in unfamiliar territory. Thinking ahead to dessert and trying to satisfy a pizza craving, we head downtown to Adrienne's Pizza Bar. 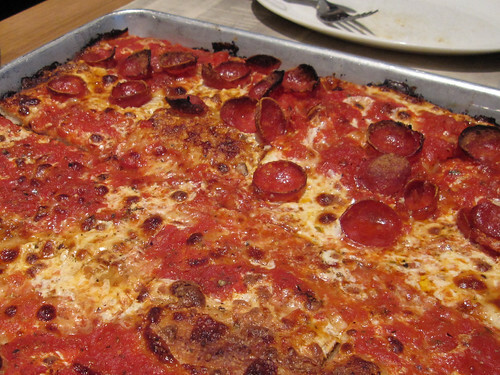 The old-fashioned rectangular pizza happily satiates our craving, largely due to the slightly burnt crust and crisp thin-cut pepperoni edges. Adrienne's may not be the best pizza in town but it sure makes for a fine celebratory lunch. Ditto - Happy Anniversary. I enjoy reading your blog. Well, happy blogiversary to The Lovely Ladies Who Lunch! Great post, great photos, great pizza. I think Adrienne's is one of the best pizzas in this city, where else can you get anything as uniquely delicious? Keep up the good work.